The great Austrian Expressionist director Fritz Lang fled his homeland in the late 1930s (rather than make propaganda films for Joseph Goebbels), and Man Hunt was the first of four anti-Nazi films he made in the U.S. The director of Metropolis (1927) worked with art director Wiard B. Ihnen on this production, which starred Walter Pidgeon as Captain Alan Thorndike, an American soldier and big game hunter who happens upon Hitler’s lodge while hunting in Bavaria and takes aim. Captured, Thorndike is tortured and left for dead by a river—but he finds a rowboat and attempts to navigate it to port without being discovered by the Nazis, who rake the water's surface with a searchlight. 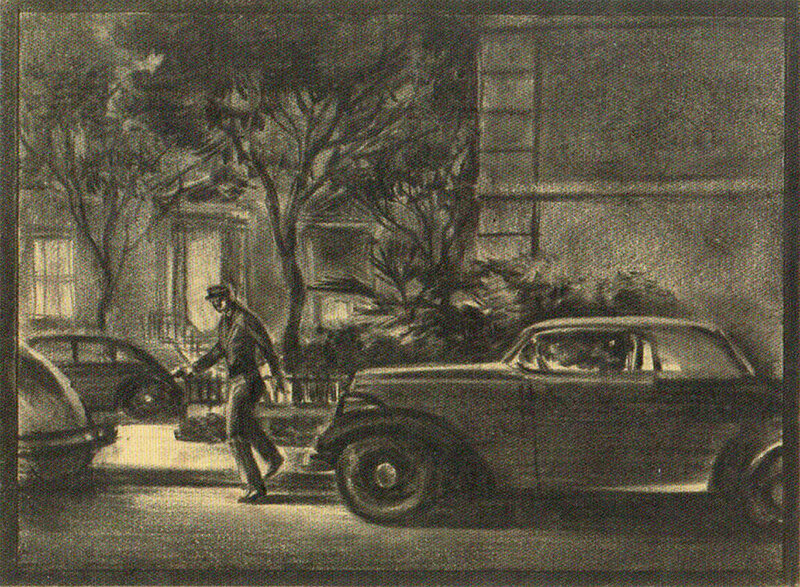 The boards shown here, in graphite pencil, are classic film noir, with large parts of the page left in the dark. Thorndike ("Thorndyke”) must turn in order to avoid the lights before reaching port where he can stow away on a ship to Britain. Ihnen, who was born in New Jersey, trained as an architect and worked for over three decades as a Hollywood art director. He was married to the legendary costume designer Edith Head. Wiard B. Ihnen’s boards, with their bold use of chiaroscuro, prefigure the expressionistic feel of Lang’s film, which was based on Geoffrey Household’s classic 1939 thriller, Rogue Male. 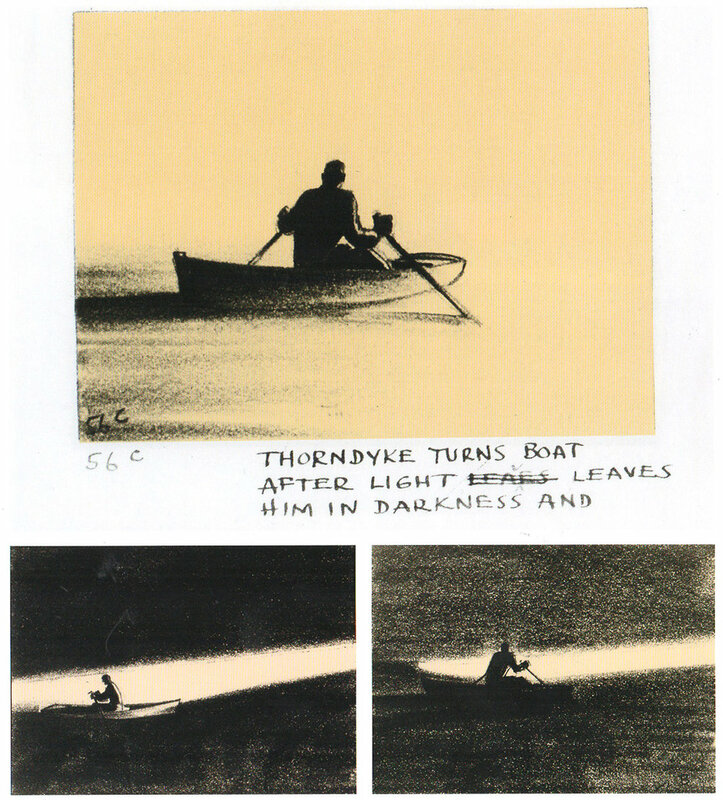 Thorndike is forced to abandon his vessel when a patrol boat nears. Captain Thorndike attempts to avoid detection in his rowboat. The Magnificent Ambersons is Orson Welles’s tragic masterpiece, his much-hyped follow-up to Citizen Kane (1941). It featured an extravagant set constructed at RKO’s studios—the Ambersons’ mansion, with its moving walls, which provided the setting for Welles’s beloved central ballroom sequence and extensive tracking shots (drastically cut in the theatrical release). Audacious and daring, The Magnificent Ambersons suffered one of Hollywood’s most traumatic post-production periods. The writer-director had negotiated away his final cut and was working in Brazil on another project when he delivered a (second edit) 131-minute film. It received poor responses from a test audience and RKO took control. “Everybody they could find was cutting it,” recalled Welles later. It is believed the film went from 131 to 88 minutes, and many sequences were reshot, without Welles’s approval, by the film’s editor, Robert Wise. It was also given a new, more optimistic ending. The edited footage was later destroyed and the original cut has disappeared; all that remains is Welles’s script and some storyboards, unattributed. The Magnificent Ambersons left Welles with a poor reputation in Hollywood and he struggled to find work after it, yet the film is beloved by critics and cineastes and considered to be one of the greatest movies ever made, its tortured history providing a poignant backstory to the action onscreen. Albert S. D’Agostino was RKO's art director and supervised the glossy look of all the studio’s films, including The Magnificent Ambersons; he would certainly have had control over the Amberson Mansion, as constructed in RKO’s Gower Street Studios. This Warner Bros, production is the Hollywood noir classic; an adaptation of Raymond Chandler's 1939 novel directed by Howard Hawks, co-written by William Faulkner, and starring Humphrey Bogart as hardboiled gumshoe Philip Marlowe, with Lauren Bacall as Vivian Rutledge. Although the plot is somewhat convoluted. The Big Sleep is still considered one of the greatest movies of that era. The look of the film in particular is spectacular; moodily shot by Sid Hickox, its claustrophobic interiors (with exteriors almost always characterized by rain) were art directed by the renowned German emigre Carl Jules Weyl. As an architect, Weyl designed the Hollywood playhouse (now Avalon Hollywood); under contract at Warner Bros, until 1947, he also designed Casablanca (1942). 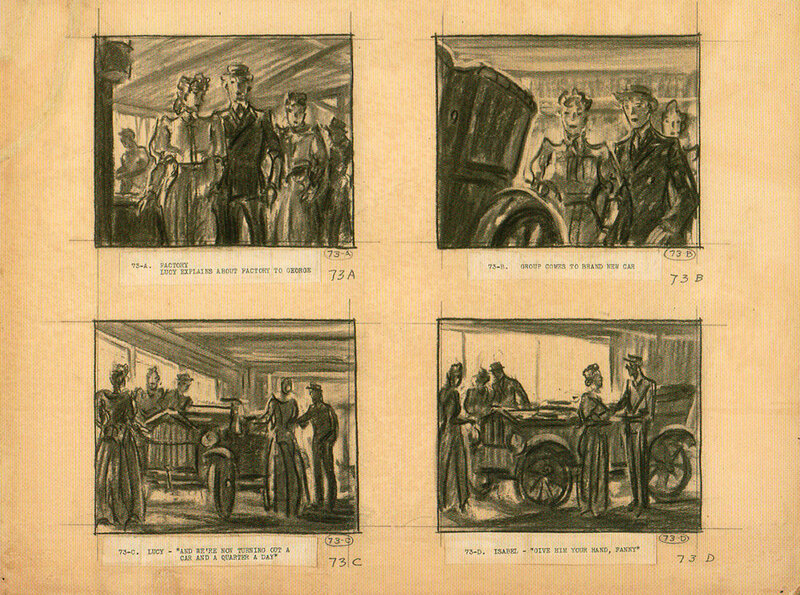 The storyboards shown here are credited to Bill Herwig, a former Disney animator of the 1930s, and are a clear indication of the mood of the piece. The original cut of the film in 1945 was re-edited and released in 1946. Humphrey Bogart as Philip Marlowe with Lauren Bacall as Vivian Rutledge in The Big Sleep. This page from Bill Herwig’s boards, drawn in pencil, depicts Carol Lundgren— the chauffeur of Arthur Gwynn Geiger, the rare book dealer who is blackmailing Philip Marlowe's client, General Sternwood— preparing to shoot the gambler Joe Brody outside Brody’s apartment.